Museo National Reina Sofía, based near the Atocha train and metro stations is housed in an impressive façade with glass and steel lift-shafts. 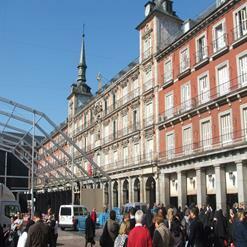 Also called as Museo Nacional Centro de Arte Reina Sofía officially, this museum was named after the Queen Sofia of Spain and houses temporary as well as permanent exhibits. The permanent exhibits include abstract, pop and minimal art movements. The museum library displays specialized in 20th century art and archives including around 10,000 volumes and around 1,000 periodicals.